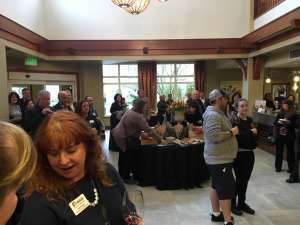 Were you at the grand opening and ribbon cutting for the new Connections Bistro and Wine Bar at Fairwinds Brittany Park on March 27, 2019? 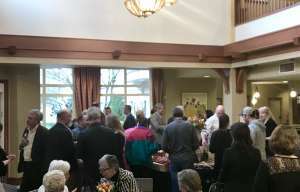 Attendees from the Woodinville Chamber (members, Ambassadors, and Board Members), as well as that of the Woodinville Rotary, City of Woodinville, and friends and family filled the Bistro’s area. The Connections Bistro and Wine Bar treated all assembled to a wide selection of wines and non-alcoholic sips, along with an array of nibbles made by the Fairwinds Brittany Park executive chef and staff. 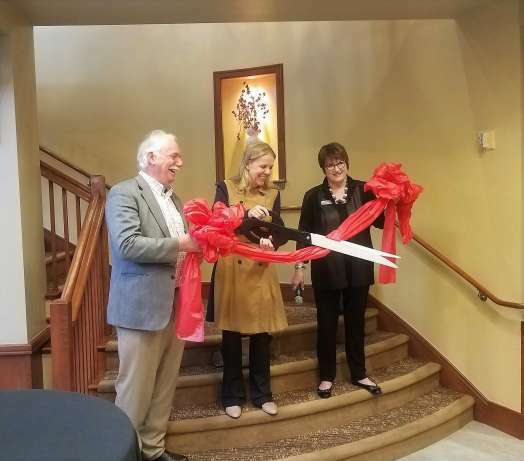 Woodinville Mayor Elaine Cook cut the ribbon and was accompanied by the General Manager of Fairwinds Brittany Park Kate Harrison and Christopher Burgess, the Chamber’s executive director. Mayor Cook noted the timeliness of the opening as a place of inclusion and gathering in the heart of the downtown area. Kate Harrison welcomed all to the bistro, highlighting the naming of the bistro, “Connections”, signified as a place for connections to be made and maintained, inviting the public to frequent the bistro at their leisure. Not to be forgotten, background music was provided by Ian Hale Skavdahl, who captured the ear of many attendees. “Who is that artist?” was heard numerous times. Welcome, Connections Bistro and Wine Bar!